Call of Duty fans likely think of the multiplayer mode when they hear "headquarters." But in Call of Duty: WWII, Headquarters actually refers to the game's new social space. Speaking on GameSpot's stage show, Sledgehammer studio head Michael Condrey explained what you can expect from the space when the game launches. It sounds similar in concept to something like Destiny's Tower or Reef social spaces. You'll gather in this area along with a bunch of other players for a bit of downtime between battles, and it lets you show off your customized character and gear. However, it also has plenty of Call of Duty-specific touches. "This is taking you into a true space where your character, your investment, division, advancements, and customizations now have a place to live," he explained. "48 players come together in this living world where you can compete in new ways, like our one v. one, or shoot-offs in our virtual firing range that now becomes a living firing range. You can be rewarded, be social, and show off in ways that I know the community loves to do." Condrey also explained that Headquarters brings a big change to the process of gaining Prestige levels. In Call of Duty multiplayer, once you hit the level cap, you can elect to "Prestige," which resets your level and gear progress. In the past, this consisted of clicking on a button in a menu, and you'd receive an emblem or a special skin as a reward. 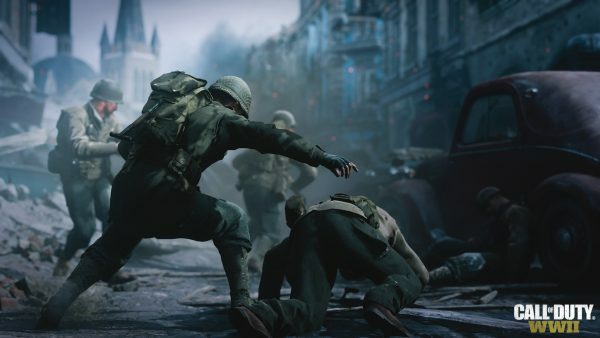 In Call of Duty: WWII, gaining a Prestige level will have a lot more fanfare. "In Headquarters, you get to go to what we are, in development terms, calling Prestige Overwatch, where you go up on the cliff above the whole Headquarters and you Prestige in front of the whole community, and you celebrate," Condrey described. "And they get to celebrate with you. And that's how it should be; this is a moment in your progression that's important, and now we give you a space where you can do that with your friends and other members of the community." Condrey and Sledgehammer seem very confident that the social spaces will be a huge improvement to the Call of Duty multiplayer experience, and he went so far as to say, "We think this is the biggest innovation in multiplayer this year." Call of Duty: World War II launches on November 3 for PS4, Xbox One, and PC. Condrey also talked about how he hopes that the game might be a Saving Private Ryan for modern video games. In addition, Activision recently announced that its multiplayer beta begins in August. Finally, you can see Call of Duty's multiplayer reveal trailer here.